Luka Jovic (Eintracht Frankfurt) gets inside the box and only has the keeper to beat, but smashes his shot just inches past the left post. He should have scored! The ball is off of the pitch and it's a goal kick for Bayer Leverkusen. Bayer Leverkusen didn't take advantage of the corner and score as the opposition's defence was alert and averted the threat. Eintracht Frankfurt didn't take advantage of the corner and score as the opposition's defence was alert and averted the threat. Eintracht Frankfurt get a corner. Kevin Trapp pulls off a superb save! He leapt to block the shot Kevin Volland (Bayer Leverkusen) fired on target after a rebound. His effort from inside the box flew straight towards the left post, but was stopped by the goalkeeper. The manager has decided to make a substitution and Mijat Gacinovic walks off the pitch to be replaced by Marc Stendera (Eintracht Frankfurt). The game is interrupted. Mijat Gacinovic (Eintracht Frankfurt) is given a yellow card. He has to be more careful now. Eintracht Frankfurt didn't take advantage of the corner and score as the opposition's defence was alert and averted the threat. Lucas Alario (Bayer Leverkusen) picks up a yellow card for a foul. The foul by Gelson Fernandes (Eintracht Frankfurt) is worthy of a card and a yellow is duly shown by Felix Brych. Substitution. Paulinho (Bayer Leverkusen) on for Julian Brandt. Adi Hutter has decided to make a change. Jonathan de Guzman (Eintracht Frankfurt) replaces Jetro Willems. A yellow card for a tackle by Karim Bellarabi (Bayer Leverkusen). Felix Brych doesn't hesitate at all to make this decision. The referee signals that it is time for a substitution and Luka Jovic (Eintracht Frankfurt) comes onto the pitch so that Ante Rebic can be given a rest. Booking. Carlos Salcedo (Eintracht Frankfurt) receives a caution from the referee. Jetro Willems (Eintracht Frankfurt) overhits the corner kick and none of his teammates can their head on it. The ball is off of the pitch and it's a goal kick for Bayer Leverkusen. A pass into the box finds Ante Rebic (Eintracht Frankfurt) unmarked. He carefully places a shot towards the roof of the net, but a brilliant last-ditch save by Lukas Hradecky denies him. Eintracht Frankfurt have a corner. Jetro Willems (Eintracht Frankfurt) decides to take a short corner instead of crossing into the box. Sebastien Haller (Eintracht Frankfurt) is unable to get a good contact on the ball from the corner and heads it well wide of the left post from close range. The ball goes out of play and Bayer Leverkusen will have a goal kick. Jetro Willems (Eintracht Frankfurt) goes over to take the corner kick and it looks like he will send the ball into the penalty box. Eintracht Frankfurt will have a chance to score from a corner kick. Another attempt to send the ball beyond the defence by Filip Kostic (Eintracht Frankfurt) is thwarted and cleared to safety. A sweet pass inside the box gives Ante Rebic (Eintracht Frankfurt) time to measure a shot, but it's slightly mishit and goes just wide of the right post. That really was a great chance! The ball is off of the pitch and it's a goal kick for Bayer Leverkusen. Goal! Karim Bellarabi (Bayer Leverkusen) beautifully controls a strongly hit pass from Leon Bailey inside the box. He cuts inside his marker and rifles the ball into the bottom right corner. 2:1. Heiko Herrlich prepares a substitution. Mitchell Weiser is replaced by Leon Bailey (Bayer Leverkusen). The referee stops play so that a substitution can be made and Lucas Alario (Bayer Leverkusen) replaces Kai Havertz. Golden opportunity! Ante Rebic (Eintracht Frankfurt) lost his marker inside the box, only to shoot just wide of the left post after receiving a good pass. The ball goes out of play and Bayer Leverkusen will have a goal kick. Goal! Sebastien Haller shows great vision to find Filip Kostic (Eintracht Frankfurt) with a cheeky pass inside the box, and his first-time shot is precise and sails low into the middle of the goal. 2:0. 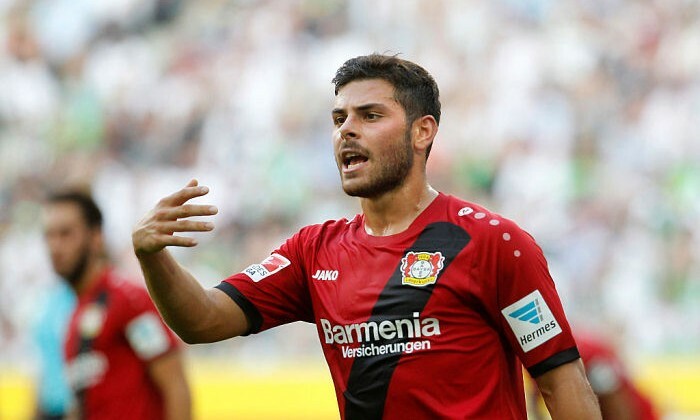 Kevin Volland (Bayer Leverkusen) is adjudged to have been offside when making his run. Another attempt to send the ball beyond the defence by Julian Brandt (Bayer Leverkusen) is thwarted and cleared to safety. The ball is out of play. Bayer Leverkusen will take a throw-in. Mijat Gacinovic (Eintracht Frankfurt) takes a shot after receiving a good pass, but his effort from the edge of the box goes just over the crossbar. The ball is off of the pitch and it's a goal kick for Bayer Leverkusen. Carlos Salcedo (Eintracht Frankfurt) is challenged in the air near the penalty spot and is unable to control his header from the corner, sending it miles over the bar. The ball goes out of play and Bayer Leverkusen will have a goal kick. Eintracht Frankfurt have been awarded a corner kick. The referee and one of his assistants both point at the corner flag. A terrific piece of skill by Ante Rebic (Eintracht Frankfurt) inside the box gives him a clear goal scoring opportunity, but his shot is blocked right on the line by a defender after the keeper was beaten. The referee and his assistant both point at the corner flag. Eintracht Frankfurt will have an opportunity to threaten the opposition's goal. The ball falls kindly for Kai Havertz (Bayer Leverkusen) inside the box and he goes for goal. It's a decent effort but flies just wide of the right post. The ball is off of the pitch and it's a goal kick for Eintracht Frankfurt. Bayer Leverkusen work the corner short. The ball is passed to a nearby teammate. 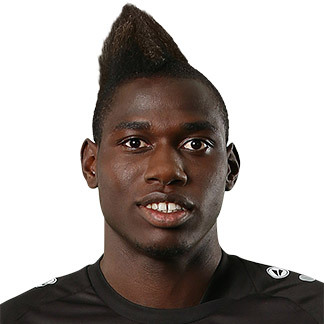 Mijat Gacinovic (Eintracht Frankfurt) should know this behaviour is beyond the rules. He was too careless with his challenge and left Felix Brych no option but to blow his whistle. Bayer Leverkusen are awarded a free kick. Let's see what they create from this. Sebastien Haller (Eintracht Frankfurt) decided to shoot after receiving a sweet pass. The ball went to the middle of the goal, but Lukas Hradecky made an easy save. A quickly taken corner by Eintracht Frankfurt. Ante Rebic (Eintracht Frankfurt) slides a pass forward, but one of the defenders cuts it out. The ball is out of play. Eintracht Frankfurt will have a chance to score from a corner. Bayer Leverkusen take the corner, but their hopes of scoring a goal end with nice clearance by the defence. Felix Brych shows a yellow card to Sebastien Haller (Eintracht Frankfurt), who isn't surprised as the tackle was really hard and late. The resulting corner from Julian Brandt (Bayer Leverkusen) is cleared. Obite Evan N'Dicka (Eintracht Frankfurt) can't expect anything else than a yellow card for his hard tackle. And a yellow it is. Felix Brych didn't think twice about pulling it out of his pocket. It's a goal! Filip Kostic plays a lovely pass into the box and finds Danny da Costa (Eintracht Frankfurt). He tries his luck from close range and coolly strikes the ball into the back of the net. 1:0. Eintracht Frankfurt have a chance to score from a corner kick, but the ball is cleared by a defender. The VAR intervenes and the referee disallows the goal as Karim Bellarabi (Bayer Leverkusen) was in an offside position! It’s tense out there as referee Felix Brych has decided to review the goal using the VAR. He makes his way over to the monitor. The ball hits the back of the net and Karim Bellarabi (Bayer Leverkusen) is the one who put it there! Julian Brandt (Bayer Leverkusen) goes over to take the corner kick and it looks like he will swing the ball into the penalty box. Kevin Trapp was forced into action to thwart Julian Brandt (Bayer Leverkusen). He found himself some space after picking up a pass and unleashed a shot to the left post but couldn't beat the keeper. Bayer Leverkusen have been awarded a corner kick. Felix Brych blows his whistle and signals a foul after Ante Rebic (Eintracht Frankfurt) brought his opponent down. Free kick. Bayer Leverkusen will probably just try to cross the ball in from here. Julian Brandt (Bayer Leverkusen) takes the corner kick and sends the ball among a huddle of players inside the penalty area, but one of the defenders clears it to safety. Some great play by Julian Brandt (Bayer Leverkusen) ends with a shot on the edge of the box towards the right side of the goal, but Kevin Trapp sees it all the way and makes a comfortable save. The referee points to the corner flag. 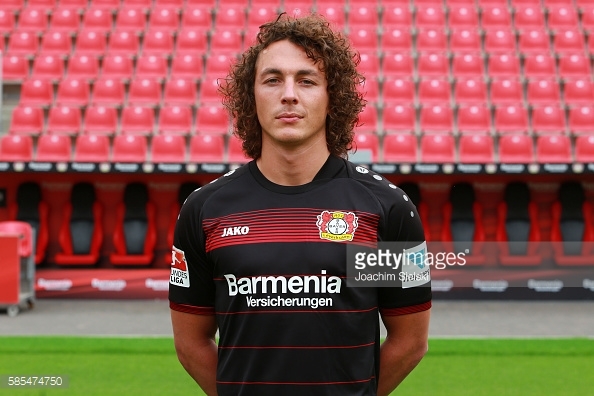 It's a corner to Bayer Leverkusen. Eintracht Frankfurt take the corner, but their hopes of scoring a goal end with nice clearance by the defence. Kevin Volland (Bayer Leverkusen) is caught off guard a bit when the ball lands at his feet, causing him to rush a first-time shot that is easily blocked by an opposition player. Ante Rebic (Eintracht Frankfurt) is obviously not following the Golden Rule: „Treat others as you want to be treated.“ He makes a bad challenge and leaves Felix Brych with no other option than to blow for a foul. A free kick to Bayer Leverkusen. Kevin Volland (Bayer Leverkusen) was standing in a clear offside position, making it an easy call for the linesman. Felix Brych shows a yellow card to Jetro Willems (Eintracht Frankfurt) for a tough tackle. The resulting set piece from Eintracht Frankfurt is comfortably intercepted by one of the defending players. Ante Rebic (Eintracht Frankfurt) wastes a good opportunity as his pass into the box is blocked by the defence. Eintracht Frankfurt force their opponents to concede a corner. The players are on the pitch and Eintracht Frankfurt will have the kick-off. Felix Brych will supervise the game today.